But what makes Bon Appetit so special? For starters, if you have ever been to their website, you would notice that there is a lot more information than just the daily menu. The whole company is based on three standards of food; it is alive with flavor and nutrition, prepared from scratch and sourced in a socially responsible manner. Albion was not only looking for a food service that made students happier, but also they were looking for something sustainable – something that would be a long-term solution of catering to student satisfaction, and also helped the environment and the local community. Bon Appetit uses fresh items and incorporates locally grown food when they can by creating menus that revolve around the type of foods grown in that particular season. By getting foods from local farms and produce markets, they reinvest in the community and reduce the effects importing has on the environment. To keep up with their dedication to providing the freshest food, Bon Appetit gets shipments of food up to six times a week. Ken Dixon, Executive Chef, explained their policy referring to shelf life of food is stricter than the standards of the health department. 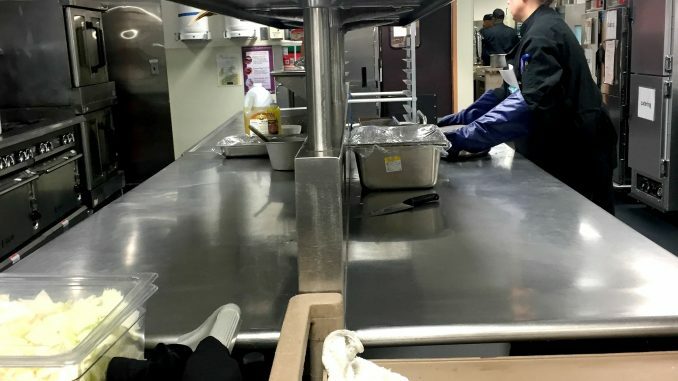 Speaking of the health department, Dixon noted that when they come for inspection, they say the Bon Appetit kitchen is the cleanest kitchen in all of Calhoun County. Even though I was touring the kitchen in the middle of the lunch rush, everything ranging from the floors to the counters was spotless. All of the food and supplies had their own places. Raw meats were not stored above other foods to prevent contamination. Every single item in the refrigerator was labelled and dated properly. This, in combination that all food is made from scratch, distinguishes Bon Appetit from other food service companies. “All the produce, all the vegetables that are down there are brought in from produce companies or local farmers and they’re in their most whole form” said David Lauffer, General Manager. This allows for everyone to know exactly what is put into the food since their chefs are cooking everything with their own hands. There’s no guessing. For example, students showed an interest in having more breakfast options, something that could be grab and go. This is where the Dub Box plays a part. Rather than serving just lunch on the quad, they set up the cart outside Baldwin in the morning for students who need a quick bite. With an increasing student population, the current spaces are becoming too small. Lauffer said there are no plans set in stone, but Bon Appetit is working with the college to come up with solutions to the overcrowding during peak lunch and dinner hours. Bon Appetit is always looking for ways to better cater to the college. Be sure to fill out those comment cards if you have any suggestions for what you, or others, would like to see in your dining experiences! Andrea is a junior from Shelby Township, Michigan. She is a Business major with a secret love for writing. If she could, she would be spending her days traveling the world, but for now her wanderlust is put on hold for the sake of education.